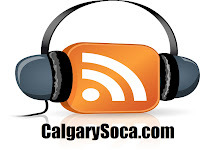 We had a new voice join us on air this week as Calgary Soca was proud to welcome a St. Lucian into the studio. Sherman joins Drew and Carrie as we deliver some more hot tunes this week. By the end of the show he even gets dubbed with his new stage name though we'll see if it actually sticks. Also following the debut of Karella's 'We Gettin' On' last week, we get another local artist delivering music to the Carnival mix. Look for Harmon33y's 'Get On Bad' along with remixes, and more new jams this week, Enjoy.